The Bradford Factor is also referred to as the Bradford Formula and the Bradford Index. At the top right you will find the online Bradford Factor Calculator, which will work out the Bradford Factor for an employee, using the Bradford Formula. If you would like to add a Bradford Factor Calculator to your website, you can do so here: Bradford Factor Calculator for your website / article. The Bradford Factor allows managers to monitor absenteeism during any set period. Many companies identify a running year as an acceptible period. The heat map below provides a visual overview of Bradford Factor scores and weightings. It is important to remember that the Bradford Factor index is only a guide. Employers staff absence policies should be carefully documented and communicated to staff. Employers have a responsibility to ensure that staff understand the Bradford Factor calculator and how it is applied. Concern (BF 45): Sufficient days for a manager to show concern and advise on possible disciplinary of financial actions, should more absences occur during an identified period. Please note that figures given are for illustration purposes only and different companies will apply different thresholds. It is also important to remember that managers should be in constant communication with their staff, in order that they understand the issues and possible outcome of any prolonged or repeat absences. 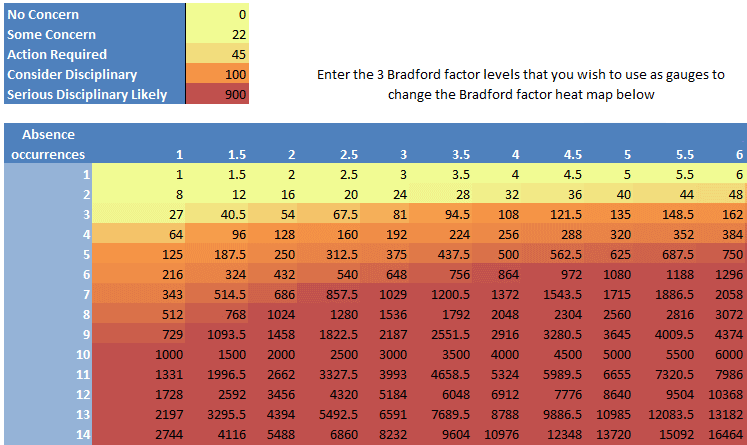 The attached microsoft excel sheet contains a Bradford Factor Calculator and Bradford Factor Heatmap. The Bradford Factor excel example is free to download and share.